I must admit this is one of those things that I always though: why bother to make it? However this year it occurred to me that with a Thermomix this just has to be the easiest pieciest thing ever. It truly is! 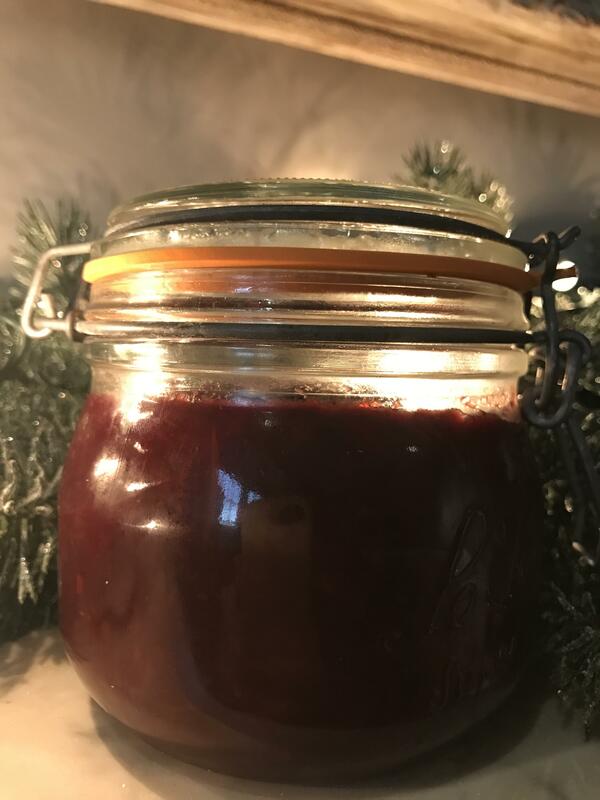 And better even, I think it gives Fortnum’s Christmas Cranberry Sauce Pantry Jar (£11.95) a serious run for its money for under £5 if you source well your cranberries and still use a fabulous port. (*) The thing is, the recipe calls for shallots and I’ve made it with and without… My preference is without, so it’s up to you. Perhaps if the shallots were sautéed first it would be a sweeter flavour. You might want to try it. I just prefer to skip step one and avoid the shallots. Also, the colour of this sauce is at it should be: deep. None of that bright red. And as for sugar, my taste is for a tart and only ever so sweet sauce, but if you want it sweeter just add more sugar. Finally, all berries are different, and if you have fresh or frozen sometimes the water content can vary. So, after 20 minutes of cooking, have a check. You want to have the fairly runny sauce of loose jam consistency. Just add more time as needed. Even for frozen berries I’d first set the timer to 20 min and then check. 1. If using shallots, chop them speed 6 for 5 seconds, brush down sides of TM and chop again if needed. Then add 15g grape seed oil and sautée 5 min Varoma speed 1. 2. Put cinnamon sticks in TM bowl, grind speed 10 until pulverised. 3. Add all ingredients remaining, and cook 20 min Varoma reverse blade speed 1. 4. Remove star anise (if you can), adjust sugar to taste, and place in jar. A friend put me on to Goodful which has cute recipes online. I tried this delicious soup which has a bit of a kick and, even better, is a sort of chuck-it-all-in-and-wait recipe! 1. Place all ingredients except thyme and coconut milk in TM bowl. 2. Program 25 min, Varoma, speed 1. 3. Blend 1 min, speed 10. 4. Add thyme and coconut milk and blend a few seconds speed 3. 5. Garnish with chives and pumpkin seeds (optional). It could not be easier to make these salts. A satisfying smug sort of thing for your pantry, a nd also an original food gift for your friends. Start with a coarse sea salt, Malden is great, but if you only have fine sea salt it is OK too. 1. Place ingredients (either mushrooms or rosemary/lemon) in TM bowl. 1 minute speed 9. 2. Add salt, and use salt to brush down the sides of the bowl and under the lid. 3. With measuring cup off, programme the TM for 1 hour, 80C, reverse blade, speed 1. If you are so inclined, and you have time, once in a while turn speed up to about 3 to give it all a good stir, and then back down to speed 1. 4. At the end stir well with spatula and repeat step 3. 5. If at the end you prefer a finer salt, then grind it to your taste in the TM. School has started and the challenge for me is to get some of my troops off to school with a healthy and satisfying breakfast that will carry them through until lunchtime. I have tried this rather pretty layered raspberry porridge and it has been a hit. It is gluten free (if you use gf oats) and dairy free (if you use almond milk as I did). Place raspberries, lemon juice, first lot of chia and first lot of honey in TM bowl. Mix 5sec/Speed 5. Reserve in a small bowl. Rinse TM bowl a little (or you will end up with pinkish oats. Layer oats and raspberry mix in a large jar and refrigerate overnight. I love the look of them, but I find them way too bitter. So a quick 28 min Varoma, speed 1 in the TM, same amount of sugar as of fruit (or less), place the steaming basket over the lid to let steam out, sterilise your jar in the oven, and you are done! Any other bountiful harvest (plums, strawberries, tomatoes…) is the same thing. I add a bit of lemon and some vanilla in some instances, not with gooseberries, though, as they are already bitter enough. Thank you to Milli’s Kitchen for the recipe. She created it for a yoga retreat but I make it for omnivores just as much. It is not complicated but it is slightly time consuming. Much better if you cook the quinoa and roast the squash/pumpkin the day before, so all you have to do on the day is mix it all, shape, and cook. This quantity made 30 mini burgers. * To cook quinoa in the TM: Soak for 30 minutes at least. Place in the steaming basket. Pour 800g boiling water into the TM bowl, insert the quinoa, pinch of salt, a couple of seconds on speed 4, then 15 min, Varoma temperature, speed 2. Remove steaming basket when done and put quinoa in a large bowl to cool down. * To roast the pumpkin: peal it, cut it into chunks, toss with some oil and salt, and 30 min in a 190C oven. Mash with a fork. Chop the onion with a drop of oil, 5 seconds speed 5. Bring down from the sides of the bowl with a spatula, repeat if necessary. Cook 8 minutes, Varoma, speed spoon. Add the rest of the ingredients and form into little balls. The mix is a tiny bit wet. Fry with just a hint of oil in a large non stick pan, squash them down a bit to shape into mini burgers. Cook about 3 minutes on each side to get them a tad crispy. Only turn when they are not sticking to the pan. Finish 6 minutes in a 190 oven. I decorated these with a coriander leaf. I have to admit, when I saw this pie in the Waitrose magazine this month it did not do much for me. I thought it would be too sickly. However, I had a request to make it for a son who loves that kind of Mississippi mud pie type dessert and it was a hit. The recipe from Waitrose is a total pain to make, requiring at least three pans and watching over a caramel and a syrup. Guess what, one TM bowl sorted me out just fine and saved me from having to make a syrup to add to the meringue. It was not too sweet either and the saltines of the peanuts just makes it for me. Try it! PS: This pie requires you to put layers of ganache and caramel in the freezer to chill. You can do that the day before, leave the pie in the freezer overnight, and just finish with the nougat meringue on the day you want to eat the pie. Put peanuts in bowl and pulse with 0.5 second burst until roughly chopped. Put aside. Put all the peanut caramel ingredients except the peanuts in the TM bowl. Programme about 10 minutes 90 degrees speed 1.5. You want to reach 90 degrees and have it at that temperature for about a minute. It will depend how soon you reach the 90 degrees based on the temperature of your cream etc. Once it has almost boiled for 1 minute, i.e.. it has been at 90 degrees for one minute, stop the TM. Reserve four tablespoons of this caramel in a small bowl and pour the rest into a bowl to cool completely. Rinse the TM bowl. Now make your chocolate ganache: Heat cream with a pinch of salt in the TM bowl at 90 degrees speed 1.5 for a few minutes (again, depending on the temperature of your cream). Make sure the cream has been at 90 degrees for at least a minute. Then programme the TM with no heat at speed 2 and add the chunks of chocolate. When they are melted add the butter and when it is all incorporated and glossy you are done. Pour half of the ganache into a deep 23cm pie and freeze for a minimum of 10 minutes. By now the caramel sauce should be quite cool so add to the caramel the chopped peanuts except a couple of tablespoons that you should reserve to decorate the top later. Bring out the pie from the freezer and add the cool salted peanut caramel (YUM!). Stick back in the freezer for a bout 5 minutes. Later pour the rest of the chocolate ganache and put it back in the freezer for at least two hours or overnight. For the nougat meringue: have a super clean TM bowl and into it add the sugar. Grind 10 seconds speed 10. Insert butterfly whisk, add egg whites and cream of tartar and beat 6 minutes, 70 degrees speed 3.5. Sculpt the meringue in high peaks over the pie. Toast it with a kitchen torch and sprinkle the reserved peanuts and caramel sauce.